Were the Vedas concerned with management? Or were they concerned with some esoteric exotic doctrine that cannot be contaminated by mundane concerns like management? It depends on how you approach the Vedas, and management. Vedas are a set of ideas manifesting as hymns (Rig-Veda), melodies (Sama-Veda), rituals (Yajur-Veda), spells (Atharva-Veda) and vast commentaries (Brahmanas, Aranyakas, Upanishads) on them, that came into being 4000 years ago in Northern India, were transmitted only orally for the longest time, and started being written only about 1500 years ago. It has had a huge impact on what came to be later known as Hinduism. These have been deemed ‘religious’ texts, meaning they deal with the supernatural, the non-material and hence, the non-materialistic. And so cannot have anything to with management, which is materialistic. This divide is a popular one. It’s a burden we are really not obliged to bear. Let’s simply decode the first verse of the Rig Veda. Language experts have concluded that there are older verses in the Rig Veda, but when the books were re-organized, this verse was located as the first one. A traditionalist will try to exclude general public people from the decoding exercise using various orthodox reasons. These isolationist rules were created to protect the sanctity of hymns, but ended up breeding corruption in the priestly class, much like the License Raj. Again it is a burden we do not bear in the 21st century. The hymn is identified as Rig Veda 1.1.1, meaning it is the first hymn (rig) of the first poem (sukta) of the first of the ten books (mandala). The Vedas are not books to be read: that’s like saying we read the Beatles! They were heard and the hymns were imagined as ten concentric circles of sound aimed at invoking Brahmana. This word Brahmana originally meant language, that which expands (brah-) the mind (manas). Later in the Bhagavad Gita, composed 2000 years ago, it is identified with God. The keepers of these hymns – hence of language, and God – came to be known as Brahmins. The hymn translates as: The fire-god (Agni), I invoke (iLe), the priest (purohitam) of the exchange (yagna), the deity (deva), the conductor (rtvik), the invoker (hotr), bestower of jewels (ratnadhatamam). The value given to fire comes from the fact that humans are the only species that control fire and use fire to control the world around them, clearing forests to make fields, and to cook food. Fire, in the Vedas, was the middle man, between the human world and the celestial world of divinities. The priest, the conductor and the invoker were all middle-men between the yajaman, who was conducting the ritual, and the deity or devata. The yajaman would invoke the divine and make offerings to him and then ask what he desired: jewels in this case. We can argue that these are mystical verses and the ‘jewels’ are actually ‘knowledge’. Shri Aurobindo of Pondicherry translated the word ‘ratna’ as ‘ecstasy’. But essentially this hymn drew attention to an exchange: exchange that is the corner stone of economics. Animals do not exchange. That’s not entirely true: chimpanzees and vampire bats are known to trade, but nothing on a human scale. 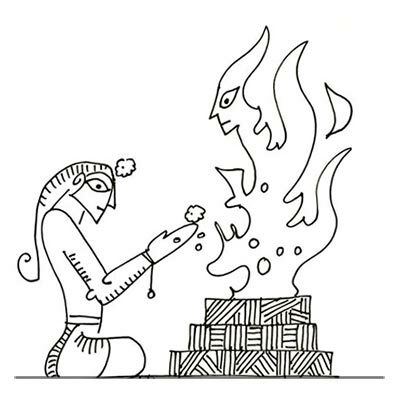 Yagna was seen as the cornerstone of culture (Sanskriti). Management is about making these exchanges efficient and effective. Exchange happens between shareholder and the organisation, between employees and the organisation, between customers and the organisation, between the state and the organisation. When exchange favours one side over the other we speak of inefficiency, or exploitation, or the absence of ethics. All the various directors and managers and supervisors and team leaders of an organisation play are the purohitams, the rtviks, the hotras, all participating in the exchange. German Indologists of the 18th century wrongly translated the word yagna as sacrifice. This meant one group of being exploited as it was expected to ‘give’ without ‘getting’. But this word has glamour in the religious world and so a preferred translation even amongst those who conduct yagna. We want to be seen as ‘givers’. But the yagna is as much about ‘getting’. Not taking but getting. So yagna is not quite a contract, that is the cornerstone of modern management, and contract as an idea comes from Abrahamic mythologies, not the Vedas. The deity is under no contractual obligation for there is no regulatory authority out there to whom we can petition in case of breach of contract. It is all about trust between the buyer and the seller, the seeker and the hoarder. When there is decent exchange, relationships thrive and society prospers. That is the direction in which the first hymn of the Veda takes us.